About six months ago, I made the scary decision to leave Community Hospital Anderson, the only place I had worked since high school, to join the vendor side as a Regional CIO in the Healthcare Division with NetApp. As I look back and reflect, I am so thankful for the opportunity I was given to grow within the Community Health Network, where I held the CIO role for three years, previously working as Director of IT and MIS Manager. Build a great team. Hire people smarter than you, and help them grow. A great team will accomplish way more than a single great person. I remember that during my first few years managing people, this was one of the hardest things to understand, because I felt like I needed to prove myself. I was fortunate to have some people surrounding me who provided feedback on my management style. I also did a lot of reading and research around different personality types, which helped me understand the people I was working with, and more importantly, better understand myself. Get out of IT. I spent much of my time trying to work with other leaders in the organization to understand their processes and problems. If you aren’t aware of the challenges in your clinical and financial areas, you can’t be there to assist in solutions. I believed it was important to meet with other key leaders at least once a week, and depending on what was going on at the time, it might have been more valuable to meet a few times a week. I also found that offering to take a colleague to lunch or grab a drink after work, really helped build relationships needed to lead the organization. And when times are challenging, the trust that has been built will be powerful. Network, network, network. During my time at Community Hospital Anderson, I was involved in CHIME, HIMSS, and vendor groups, but I think it’s also important in today’s age to include social media (Twitter, LinkedIn, etc) as part of your daily life. In my role with NetApp, I am blessed to talk with some of the best healthcare leaders in this country. Healthcare is different than many industries in that we share with each other, so take advantage! Always keep learning. Both healthcare and IT in general are always changing, so always keep learning. 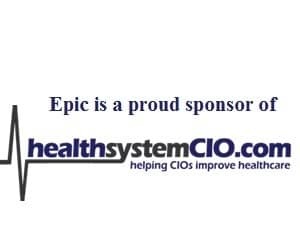 Today, a CIO isn’t tasked with just keeping the lights on — the job is about creating solutions.You may be using EMR tools to improve clinical quality, leveraging analytic tools to help reduce readmissions, or modernizing the data center to reduce complexity and lower cost. For me, making the change from the provider to the vendor side may have been scary, but I believe the lessons I learned along the way helped me to prepare, and make me better at everything I do.